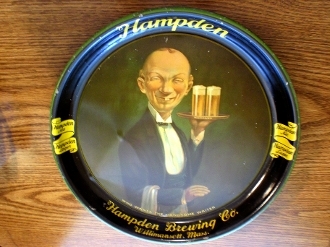 Hampden Ale & Lager 1930's beer tray from Williamsett, Mass.. "Who wants the handsome waiter". Has some surface & edge wear and a slight dent in left lower area, yet a nice piece all in all. 13" diameter 1 1/4" deep. Nice collection display tray.